When I was a wardrobe stylist in NY, hurry up and wait was the motto on television and movie sets. For the record, I wasn't on any movie sets (I wish). I did a few commercials and helped at 30 Rock (the address) with the Rosie show and Saturday Night Live (experiences I will always treasure). As a writer, hurry and wait has become part of my life again. I hurry to write my column by the deadline, but it doesn't post in the newspaper until a couple weeks later. And, if I ever fulfill my dream of being published, I'd wait much longer for my book to come out. As I move into the querying stage with my newest novel, I already know what to expect. Last year I queried my novel for more than six months before finally shelving it. Which was the best thing I could have done. Because I started two other projects and then settled on my current one. And I got better. At everything. Writing and networking, learning about the publishing business, and narrowing my agent list down to those who might be the best fit for me. And I learned one key thing as well. Not to hurry too much. Because if you do, you may not write or send off your best work. You'll hurry to get it off to the agent, and then wait, wait, wait. While you're waiting, you'll regret never changing that one passage or giving your manuscript another pass. Take any extra time so that you have NO REGRETS. It's much harder than it sounds. And it's STILL a work-in-progress for me. I think every round is a battle to overcome. You learn something new each time even when you aren't feeling like learning something new! 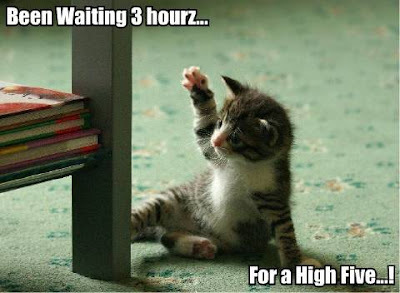 I think the adorable kitty said it best!! Way to go! thats is it, we have to prepare, just like in battle. You wont go to war without knowing tactics for fighting, or strategy, you prepare yourself, and so do we, writers! Great piece of advice! You are absolutely right. this is advise if great for daily life. we all just need to take our time to get things right. this is true, very true. I guess I never thought I was good enough to write, so instead tried all different jobs and interests (fashion, teaching) and finally took the plunge. My “day job” is my jewelry business and writing a weekly newspaper column (freelance from home, which is DIVINE). No sugar daddy here! Thanks for asking! I had a very similiar experience. I let a book go that I had worked on with a partner. To say I knew it wasn't a worthy book and hoped it wouldn't get picked up is, saying it lightly. I think the writer I am now could see the books faults. You are so right! Writing is about waiting and waiting and waiting. But why does it have to be so hard to wait!?! Wow, it sounds like your life has been a fun adventure already. I want to work on SNL stuff!!! You are so right about the hurry up and wait game. Best of luck on the querying. You'll keep us posted, right? right? Very true about the hurry up and wait and writing. It torture, though. Love the kitty. Some things I am patient for, others, such as waiting in line, I am not. The job in NYC sounds like it was fun! I am glad that you are so candid about the writing process. It helps me know what I need to look forward to when I actyally start to put my thoughts down on paper. I definitely agree that it's a fine line between waiting for the right time and procratinating for perfection. I would be interested in learning how you were able to switch career industries without skipping a beat. I know you mentioned teaching, as well as designing. I'm looking to go in a a COMPLETELY different direction (industry wise), but it's so hard to get my foot in the door, especially when I have so many years of experience in this industry. Any words of advice?? Great post. Seriously though, my life has been one GIANT lesson in hurry up and wait. I have been in a holding pattern more times than I can count. Still sometimes I shake an angry fist at the sky and stomp my foot like a child, but patience has been a lesson I have learned time and time again. I didn't get it the first few times X_X. Very sound advice even if sometimes easier said than done, it's the absolute truth. Yeah, I feel this so hard. I've dropped the "Hurry up" part too. Now I just roll with the waiting, which seems to go on...and on...and on. This was a hard lesson to learn. And I sure learned it the hard way. Writing is something I have always loved to do. The closet I have ever come to being published was in a letter to the editor of a tiny local newspaper. Those are some wonderful places you have worked. Hurry up and wait is not easy. This is the hardest lesson for me. I am extremely impatient...instant gratification takes too long in my book. Boy oh boy can I related, writer friend. Not until I experienced a full year of trying to escape the waiting vortex that is the writer's life, did I realize the value in the waiting. In the waiting is where you grow. And get to be a better writer. You know what they say. Good things come to those who wait! I'll be waiting anxiously to read your book! It's even worse in the newsroom! i've come to enjoy the waiting, and the down time in life..it took me a while to feel that way though! and i love the journey you've taken in life, so cool! I can't even imagine the agony of the waiting!!! I so admire you and those people who set out to publish books. I wish you the best luck with it too!